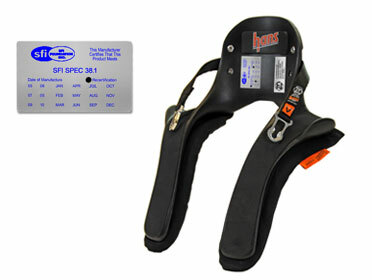 As of Jan. 1, 2012, Head and Neck Restraints must be recertified every five years to meet SFI rules. Devices passing the inspection will receive a new SFI 38.1 conformance sticker marked with the inspection date. This only required for SFI approval. Recertifcaton fees are typically $40 - $100USD, which includes the cost of a new SFI label and tether replacment. The fees vary depending on the type of tether system installed. Hans® device recertification typical turnaround time is 3-5 business days. However, If you need faster service, please let us know & we'll do our best to get your device serviced on time.